The network effects of shared and public transport: How one-way transportation systems strengthen and rely on each other and can become so convenient that cars become an annoying, slow alternative. Eventually, these shared and public transportation networks will enable the adoption and survival of on-call autonomous vehicles, as personal car ownership cannot be effectively replaced solely by a network of on-call autonomous vehicles. 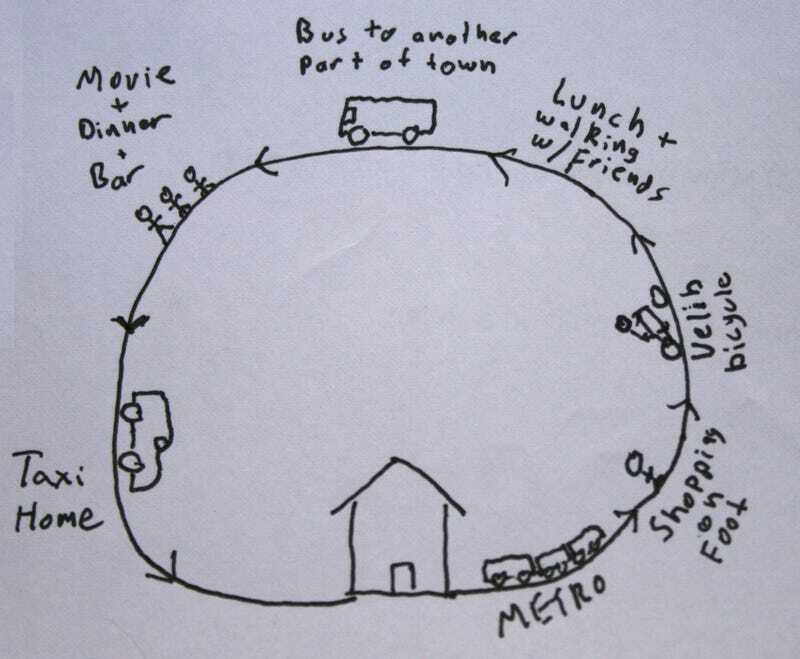 When there are a variety of easy-to-use, consistent, fun, and inexpensive one-way methods to get around, the end result can be much better than a car—faster, more relaxing, and more fun—and owning, maintaining, and having to drive a car becomes the expensive and slow alternative. Every time you leave your home, no matter the method(s) of transport, you’re going on a tour of the city that starts and ends at your front door (in French, the word tour means “lap,” as in “once around a circuit,” like the Tour de France or a tourist—someone who makes a quick circuit around a city or a country). If you choose a car—or even a bicycle—you’re married to it for the duration of the tour. You’re obligated to secure the car whenever you leave it and you cannot abandon it mid-tour. Mode-switching forces the creation of a mini-tour; a flower petal-like loop that must start and end wherever the car is stationed. In effect, you’re starting a mid-day trip away from your car—and it must be completed before your journey continues. Eventually, the day’s journey looks like a daisy, with the car on the perimeter of the flower’s central disk, and each trip you take on foot when you park the car forming a petal. If you bump into a friend, all plans must take both your and your friend’s cars into account; after all, you’re each still on your own, separate tours of the city. Extreme example : consider parking in an airport parking lot before departing for a week-long trip. Nearly your entire trip is a petal on the car’s tour of the “daisy’s central disk,” which will remain paused at the airport, half-complete, until your flight back. An airport parking lot is a gathering place for privately-owned cars that are on half-complete tours. Zipcar sells daisy tours: you can rent cars by the hour, but not for one-way trips. That renders Zipcar more expensive than a taxi for a night out, and cripples the service for weekend trips, tying up cars for entire weekends rather than the hour or two (each way) it would take to get to another city. If a bicycle is analogous to—and competes with—a car in that respect, bikeshare is a one-way trip that competes with a taxi or a subway. As with a taxi, bikeshare lets you conjure up a quick way to get around and have it disappear when you’re done with it. Ride to a party, take a metro with friends to the next spot, then pick up a different bicycle from a different station for the ride home. Each segment of the tour is a one-way trip to the next spot, and you can be creative connecting them—subway, walk, bike, walk, subway, walk, taxi, and so on until you get back to your home. It’s like swinging on monkey bars. Every step or leg you take is forward to the next monkey bar that will swing you across the city, not a step away from your car that you will have to retrace. An added benefit is that you are not obligated to skip parts of the city or destinations for car-related factors, where traffic or parking hassle means a car is no longer an acceptable option, or an option at all. Note : Soccer moms are stuck in endless daisy tours, and work with other moms to give their kids enjoyable circle tour lives: Drive kids to school. Pick up kids from practice or from a friend’s house. Kids are circle tour: Get driven to school. Get a ride from practice to a friend’s house. Walk to another friend’s house. Get picked up by mom. All the trips are one-way. What follows is a list of the current players. Multiple fixed stations on sidewalks and repurposed parking spaces throughout a city. 3-Speed, heavy-duty urban bikes with baskets and integrated head and taillights. Daily, weekly, or annual memberships (annual fees range from $6 in Marseille, France to $149 in New York City). Costs are structured to encourage short trips, i.e. first 30 m free, $1 for the next 30 m, $2 for the following 30 m, and then $4 per half hour thereafter. In Madrid, pictured above, shared bicycles have electric assist. Bikeshare is generally cheaper and more convenient that owning a bicycle, except for die-hard commuters who travel long distances. Riders check bikes out from fixed stations with a membership card. Initial sign-up includes credit card verification. Free-floating, GPS-enabled scooters dot city streets, and can be both picked up and dropped off anywhere within a pre-defined GPS fence. Riders check out scooters with a pin-code generated in-app. Helmets are contained under the seat, and can adjust for size, M-XL. Sign-up includes bank and driving license verification. In Paris, the scooters are electric and limited to 50 kph (31 mph). In Milan, the scooters are 400 cc and much faster. Unlike Zipcar—which is nothing more than a short-term car rental service—proper carshare systems offer cars by-the-minute or by-the-15m for one-way trips, thus enabling rich, multi-modal tours. Paris is home to a fleet of electric cars, each of which can be checked out from charging stations—in this case, repurposed parallel parking spots—and returned to any of the other stations. In Marseille, France, 50+ free-floating electric Renault Twizys are available to be checked out from and returned anywhere within a number of geo-fenced areas. TOTEM, the company that runs the program, manually recharges each vehicle when needed. The cars have a maximum speed of 80 kph (50 mph). It costs 1 EUR to make a reservation, and then 1 EUR / 15 min. But vehicle share isn’t the only game in town. Bikeshare is the most obvious example of these new one-way building blocks that help build satisfying tours, but there are many others. One great way to strengthen intra-city alternative transport is by enabling residents to go car-free when they’re outside the city-strong Blablacar community. Blablacar is quite different from bikeshare bikes and carshare cars. With Blablacar, you buy a seat in someone else’s car or sell a seat in your own car. In 2003, a Frenchman named Frédéric Mazzella was stuck far away from home and was looking for a way to get back. Was there not some way, he wondered, to get in touch with all the people who were driving the same way—and who had empty seats in their cars? Surely such a system must exist. After a quick search revealed that it didn’t, Blablacar—then called Covoiturage—was born. The idea is simple: drivers can sell a seat in their cars and travellers can buy a seat. It is a bit like a tiny version of a bus, but with thousands of times more routes, and a surprisingly human element. At first, it might seem scary to be in someone else’s car, or to have someone else in yours. Yet after a journey with a gregarious passenger who pays to keep you company, or with an interesting driver that feels like the world’s friendliest (and cheapest) car service, you realize Blablacar can be the best way to travel routes between 2 and 6 hours, bar none. How does Blablacar so comprehensively beat the other long-distance transport options on price? The drivers are not professionals, and the law forbids passengers from paying anything more than their share of fuel and road tolls—this means that as a passenger, you pay the driver a quarter of the expenses, and the driver drives a route he was already planning to take. A 10% fee on top the shared expenses goes to Blablacar for their service. Blablacar is the internet’s way of absorbing and organizing hitchhiking. The cost isn’t exorbitant; if I were hitching rides across a country, I’d be buying the sandwiches and coffee for the drivers, as well as chipping in for tolls and gas. Blablacar costs roughly that much—about $0.10 per mile (Uber, for example, costs more than 10x as much). The reviews and verification system are welcome, and the scheduling enables the elimination of the unbearably long, unpredictable wait times that plague hitchhikers. Blablacar’s service—making hitchhiking fast and practical—is well worth the 10% fee. Aside from exceptional train or bus deals, Blablacar is the least expensive way to travel, offers many more routes than do buses or trains (albeit with unpredictable scheduling), and passengers can at least ask to be picked up or dropped off in specific places. When choosing a mode for a leg of a tour, factors include cost, convenience, and speed. Blablacar has opened my eyes to a new trip factor: the social element. The big surprise with Blablacar trips is that they are entertaining in a way unlike any other method of transportation I’ve ever used. Thought experiment : What are some other possible evaluation parameters of a trip: How much it messes up your hair? Excitement? Probable sweatiness? Amount of exercise? Lack of traffic / stress? Beautiful views? Option to work on a laptop? Option to talk with others? The unique Blablacar Experience: We’re all so busy that it can be hard to find a long stretch of time to spend with someone—the only time we’re free is when we are moving, and Blablacar lets you have a chat with someone during a time you would otherwise be idle. You spend the trip working out just who you’re sitting next to. Right off the bat, you have a reason to talk to the driver or passenger. Maybe it was hard to find the meeting point. They ask if you’re cold, or why you’re going to visit this particular city. Somewhere in the ensuing discussion a real conversation will start. After a few hours of chatting, laughter, and listening to music, you pay a bit and then head off—car-free—into a new city. On the way, chat about whatever you want; you won’t be bothering a whole train or plane. Many drivers say that they adhere to rules and safe driving techniques more stringently when carrying passengers. After each ride, you can review the driver’s personality and safety on the site. During booking you can see how a driver or passenger has been rated and reviewed. The experience is a bit different as a driver. You make some money but also lose the ability to alter a trip’s scheduling last-minute. You may also have to wait a bit if a passenger is late. In exchange, you get a nominal amount of money, live entertainment for the duration of the trip, and possibly insider advice on the city you’re driving toward. I attended a trials motorcycle competition and at first was shocked at how competent the riders were; they seemed to be able to ride over anything. When the novelty wore off, it became clear that scrambling over the course without the motorcycle—like the spotter on the right in the picture above—would be trivial. The event was a competition to find out “who can do the best job of coaxing a heavy motorcycle over course that would otherwise be easy to climb over.” Living a modern life with a car poses a similar question: “How can I bring a car with me each day in the way that least inconveniences me?” A tour’s route and timing must be created to meet series of the car’s requirements, which can become more influential than the original idea for the tour itself. The downside hassles associated with parking, traffic, one-way streets, possibility of alcoholic drinks, etc., can quickly outweigh the original upsides of stopping at the destination. Note : this is part of the reason why big box stores are so popular in car-centric locales. You can do a lot (buy a lot) with the addition of just one “petal,” and even if the shopping experience is less satisfying and less personal, it’s an acceptable tradeoff considering the alternative is dealing a journey to the center of a dense city, dealing with scarce parking and traffic, and adding either one big walking petal (one half of which will be returning to the car), or adding many small petals and dealing with parking and navigation each time. In Barcelona or New York, you can walk through the city and pick things up as you go, buying a few things each day as necessary. You have fresh food in your house, and neighborhood specialists—shoemakers, butchers, and cheesemongers—proliferate. Even when it’s obvious that there might be a better combination of one-way modes for portions of a lengthy tour—Caltrain or plane, perhaps—it can be hard to resist taking the car anyway. The impetus to take the car is overwhelmingly strong not only because of the sunk costs—it’s already been paid for, insured, registered, maintained, and washed—but also because cars are people’s largest, most rapidly-depreciating asset, and the less the car is used, the lower its ROI. Furthermore, since there are few non-rental-car transport options at so many destinations, one must also factor in the hassle and cost of sorting out a rental car. Better to take a personal car, then. It seems American cities are specifically constructed to get us into this trap. All the necessary networks—bikeshare, scooter share, carshare, and rideshare—already exist. High-speed rail—though welcome when available—isn’t absolutely necessary to have a carless life. One must, however, be willing to examine the discomfort car ownership causes, and be ready to experiment. You will have fewer modern frustrations—searching for parking and later returning to the same parking spot, sitting in traffic, and cleaning cars—in exchange for more effort—walking to a shared vehicle, pedaling a bicycle, being cold, getting wet, etc. Similarly, there will be more old-school satisfaction, talking, riding bicycles, visiting small shops, and walking across parks. When you combine bikeshare, carshare, scooter share, and Blablacar, you get a cheaper, more enjoyable transportation system that can stand on its own. Furthermore, the day’s transportation itinerary is completely changed by eliminating the need to double back to a car in order to move it to its next resting place. Personal scooter or electric car throughout the week, Blablacar to parents, scooter-share in their city. Conventional, rental-car-dependent New York : Subway during week. Rent a car to drive to another city, park in that city, walk or bus around that city. Drive home. One-Way New York : Subway and bikeshare during week. Bikeshare to meeting point in town, Blablacar or train to another city, scooter or bikeshare around that city. Blablacar or train home. Conventional car-rental on vacation: Fly into Heathrow, rent car (300 GBP total inc. gas), drive to Cornwall, leave car parked all week. Drive back to London, fly home. One-Way vacation: Fly into Heathrow, take blablacar (30 GBP) to Cornwall, take bus for the last 45 minutes to destination. Use family car if necessary. Blablacar back to London, fly home. In Europe, this multi-modal, one-way transport is already a reality. Both Paris and Milan have all the systems that are listed here; any visitor can sign up for bikeshare, free-floating scooter share, or free-floating car share, and both cities have active Blablacar communities and long-range public transportation networks. Blablacar requires driving license and bank information. For the car and scooter shares, sign-up involves sending in bank information and driving license verification. To use either system, your phone must be on and have internet access. The two bikeshare systems require only bank information, but there is a physical plastic card for each—to check out a bike, you must have the physical card in hand. As we’ve seen, the network effect of one-way sharing systems is great, but with current signup and payments systems, accessing the network quickly becomes convoluted. The effort of gaining access to multiple systems (i.e. multiple systems in every city you visit) is enough to keep many in their cars, and short-term prices are much higher than annual memberships (Paris, for example, is 8 EUR for 1 week or 39 EUR for the year). One-way legs are why autonomous cars are so interesting. From a city’s perspective, autonomous “on demand” capability is welcome because it removes cars from the road by dramatically increasing their duty cycles—many cars sit for 23 hours per day. From a driver’s perspective, autonomous cars are interesting because they fit into a day more like a taxi does—a car at your disposal but don’t have to park it or double back to it. What I’ve learned from using all of the other forms of transport-sharing methods mentioned earlier is that they all fail or are sometimes not available—subways go out of service, bike-share stations are empty or non-responsive, there are no free-floating electric vehicles near you, Blablacar drivers who cancel at the last minute (has happened 1 in 10+ times for me). When a city has a group of one-way networks that can come to the rescue when one does fail, the shared transport network is strong. Autonomous cars will be a welcome addition to the shared pool, but in order for people to give up their personal cars for them—an action that main part of the dream of autonomous transportation—they will have to be supported by subways, Blablacaresque rideshare networks, and bike-share, car-share, and scooter-share. To succeed, carshare, bikeshare, and scooter-sharing systems need a third-party payment and driving license verification system, so users can travel the state, country, and world with immediate access to the various systems in each city. This simplified access will also let small sharing systems thrive in tourism-heavy locales, as new systems instantly have a userbase of millions of potential users. There should also be a way a friend can have their license verified—but not have a payment account. Then, if you wanted to rent a bike or scooter them, you could pay. Similar to the way What’s App users pay for friends’ subscriptions. Google Maps should also incorporate multi-modal transport like this, to show would-be drivers how public transport could be faster if the walking segments were completed by bike. I’m so convinced of the luxury afforded by switching modes mid-trip that a modern car no longer seems like the best method of transportation. The ultimate way to get around is to use the ideal method—whatever it is—for each leg of a journey. Conjuring, using, then easily divesting whatever locomotion best at each moment gives a feeling of freedom that cars can no longer match. Why aren&apos;t there any 3-person motorcycles? Why do we allow head-on collisions (and left turns)?